First things first, I expect that if you're reading this, you're clueless when it comes to beams. Why? Because you saw beginner and came to this tutorial. That being said, my job is to help you no longer be clueless and show off your awesome beam weapons and abilities in your future maps :D This will also help to prepare you for my more advanced beam tutorial. We will be spending all of our time in these 3 tabs. If you have to go to another tab for any reason other than to make a turret, weapon or unit, you're in the wrong place. This is going to be all about the simple mechanics behind how beams work. Before you create the beams it's important that you see what it is they do in game. Look at the terrain before you Test Document (Ctrl + F9). In the middle are the two units that shoot beams and in the NE corner is the tower that shoots lightning. All the other zerg units are stock. Now test the document. It's going to say it's tied (I ignore triggers in example maps) so click "Return to game." Start by attack-moving all the Lancers (Marines) into the SW corner. Pew pew pew! Lots of dead zerg by colossi beams. Now take both groups and attack-move into the NW corner. Again, notice that Ionic Splits will hit their target and then fork to the Ultralisks until they are almost dead. Lastly, take everything and attack-move into the NE corner. Uh oh, massive lightning tower! If you've played any TD maps prior to this, you might notice that the lightning beams aren't coming from the very top. Instead they're coming from the rod slightly below that. It looks more realistic. This is done using Site Operations. Also, the beams are brighter/thicker than they normally would be (you might not notice this if you haven't seen them as they normally are). That's more Actor Events. Everything you see was done with Models, Actors and Events. Make sure your Data Editor (F7) is open and ready to go. You can either open the Previewer (Ctrl + Shift + V) to select the beams you want or you can use the sames ones I did. If you choose your own beams it will be up to you to swap them in where I place my beams and match their animations when we go into Actor Events. I will give reminders along the way to help those who want to do this. We've only got one effect to make: damage. Click on the effects tab. The effects will show up on the upper left box, it's links (objects that are tied to it) will show up in the bottom left box and the entire right hand area is the data editing field. Make sure all 5 buttons (ignore the 6th on the other side of the divider) left of the search bar are pressed. This will allow you to follow my "short hand." AI Notify Flags, Flags and Response Flags are VERY important to apply to every damage effect you make. If you don't, the AI won't know what to do when attacked by them which will prevent units you attack from returning fire if your units aren't within their proximity auto-acquire range. In my more advanced tutorials I won't include these as I expect experienced mappers to know this and apply it on their own as needed. Additionally it can help to NOT have units return fire if you need them to hold still long enough to see what happens visually. Keep this in mind when testing abilities. The rest of this tutorial will have these included to help you get acquainted with these fields, however. If you are using a different model, make sure you set Animation Properties to whichever animation actually shows up such as Birth or Stand. Some models don't have more than one animation. For example most impact models just have a Death animation. Now your beam will show up every attack and make the proper sounds. Start by renaming the Marine model Lancer. 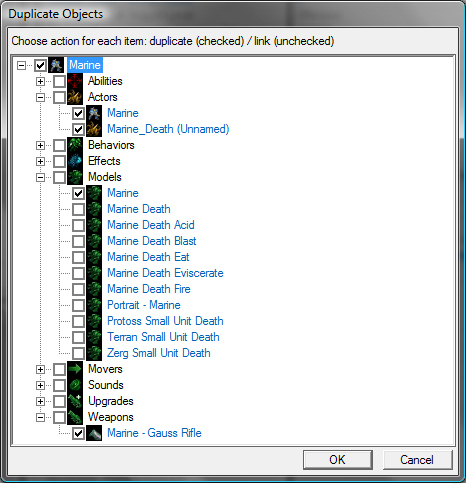 Go on to rename the actors Lancer and Lancer_Death and the weapon Plasma Lance ("Lancer -" in the Editor Prefix field). Now delete any abilities, command card buttons or behaviors you don't want and decide on your structure stats (HP, armor etc). Finish by renaming the unit Lancer. This will cause the damage to originate from the search allowing your beams to connect from this impact as opposed to your unit. This is VERY important if you want your beams to chain in any capacity. This should allow you to shoot a target and have two more beams shoot from that target to units close to it. If you find that not all of your effects are landing, there is a chance that Effect - Maximum Count<</color>> on the Effect - Set<</color>> is set to 1 instead of -1. This field sets the maximum number of effects the set can create at once. Thus -1 is infinity and 1 is only a single effect. If you want more beams, set a higher Maximum Count on the Effect - Search Area. The Target Sort will also cause the forking beams to hit beefier targets first. You could even add bonus damage against armored/massive targets if you want the bounces to be extra effective against larger targets. This will make your void beams a similar shade of green as their forking beams. Notice that I didn't put an impact sound. This is because we're going to attack it to the forking beams instead. This is because you don't want the impact sound to play if the forking beams aren't actually hitting anything. If you want a separate noise for the void beam itself, you can, however, add that. I left it out to avoid sound clutter. Start by renaming the Hellion model Ionic Splitter. Go on to rename the actor Ionic Spliter, the turret Ionic Splitter and the weapon Ion Cannon ("Ionic Splitter -" in the Editor Prefix field). Now delete any abilities, command card buttons or behaviors you don't want and decide on your structure stats (HP, armor etc). Finish by renaming the unit Ionic Splitter. Because we have a turret, we need to enable it before it will be able to fire properly. This actor is what is going to allow us to adjust where the beam chain shoots from on our structure. 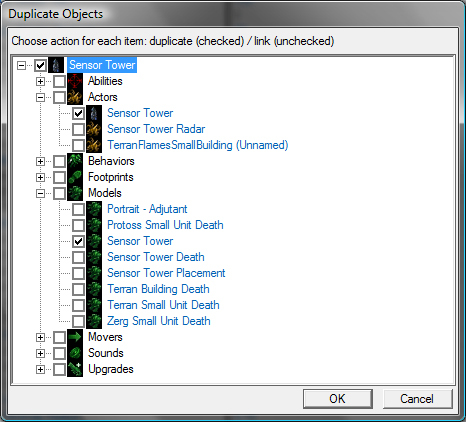 Start by renaming the Sensor Tower model Lightning Tower. Go on to rename the actor Lightning Tower. This structure doesn't have a weapon so you'll have to add one. Hop over to the Weapons Tab and make a new weapon named Energy Coil using the default settings. Add "Lightning Tower -" in the Editor - Editor Prefix field. Now return to the unit to delete any abilities, command card buttons or behaviors you don't want and decide on your structure stats (HP, armor etc). Finish by renaming the unit Lightning Tower and adding a new weapon to Combat - Weapons + using the Ionic Splitter turret and your newly created weapon. If you'd like to learn a more advanced method of beam chaining, see my Dynamic Beam Chains tutorial. bummer nobody replied here yet, but this tutorial is just the thing I had been looking for, thanks! It's most likely due to the other tutorial I previously made of a similar nature. Those who were first looking already saw that. No biggie, I just know some asked for a more accessible version. You can follow my tutorial perfectly and still not get it "right" if you're using the specified values on a different unit as your description sounds like. Depending on the actor/model you might need different values for where the beam is going to fire from and to. So what unit are you using this beam weapon with? Also, if your beam isn't showing up that's usually a sign that either your Effect - Damage isn't starting at the unit (Source Unit) and ending at the target (Target Unit), preventing the beam from connecting the dots. Possibly one of the actors doesn't have the beam creating when the Effect - Damage is firing. The other most common reason is that you took a beam model other than the one I was using and didn't specify the right animation in Animation Properties. So your beam could actually be successfully created, but if you're telling it to use the animation "Stand" and it only has the animation "Birth," it won't show up at all. Im using a maraurder copy as my unit, and i haven't changed the targets etc for the damage effect. I just assumed they would've been correct. The beam im using is 'Tractorbeam.m3' because it looks quite ice-like. However, when i was using the collossi beam, it still didn't show up. Also, i want to make this apply a stackable slowing debuff. I would do this via a set. Would i change the animation play to be when the set starts, or stay with damage/ debuff? If you're comfortable with it, toss me a PM to your map or attach it to your post and I'll take a closer look at it. Hey, i was wondering if i am doing something wrong or if anyone else is having issues. When i go to open the example map in the SC2 Map editor i get an error that sias "Dependency data could not be loaded. Continue anyway?" When i do so the map is solid black and there are little grey balls all over. If i test the map then i just get a black screen that will do nothing. Any ideas? It sounds like you don't have the latest patch OR your editor isn't loading the SC2 Standard Mod files correctly. Have you tried loading maps from other tutorials? I tried to open your other 2 maps from your other beam tutorials but same thing, no luck. On the other hand i had a friend send me a map he was working on and that opened up just fine, so now i am really confused. Do you, by chance, know what version he (and yourself) are patched to? My units end up with beams that shoot THROUGH their targets rather than stop at them? I followed the entire tutorial and recreated the unit on your map and it worked perfectly. On a fresh map though, I ended with units firing through their targets. Really nice tutorial. I especially liked how you included a map with the finished products so I could check mine against that if I got confused. My only suggestion would be that, since it is a tutorial for beginners, it would be nice if you included an explanation for some of the steps/values. I have no idea what setting the maximum count to -1 does or why it is important 8P. Still, all in all an excellent tutorial. Thanks for taking the time to make it. Prozaic - for the Lightning Tower tutorial, it seems like there's no included step to add the Model "Bounce Beam" to the actors "Bounce Beam 1", "Bounce Beam 2", and "Bounce Beam 3" - which is necessary for the beam to actually show up. Am I wrong in saying that got left out? Thank's for the tutorial. You need to fix a copy and paste error in the Ionic Splitter 'models tab' section. 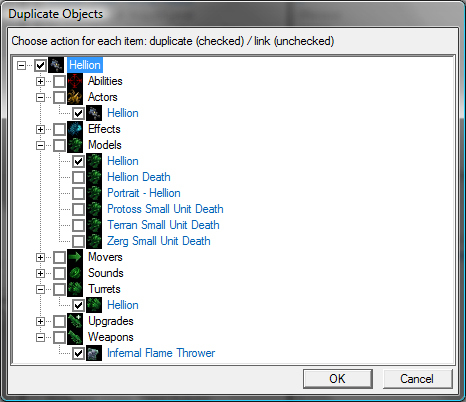 Also, the boxes checked for copying the hellion do not match up with the text below it (death model). Question: I have a beam that is created by event: unit birth and is supposed to connect two attachment points on _Unit, so I put the two attachment points into host launch ops and host impact ops. However, while this works, the beam doesn't move with the attachment points (which bob up and down) if the unit is stationary. It works fine when the unit is moving! What gives? @BrotherLaz can you be a little more specific? What beam model, unit model, actor animation (Birth, Stand, Spell, Channel etc) and what attachpoints are you using on this unit? Depending on what animation it is and what attachment point you used, some anchors don't move with various animations. In other words, while the unit is moving, all anchor points are moving, but if you've got the unit playing it's "Spell" animation, the point you used could be stationary during it. You can check this by looking at the anchor points on a unit in the previewer. Pick your animation, press "A" and then watch the point to see if it is bobbing. Not a spell anim, just a regular stand anim. :( It even happens during a fidget and is very noticable then. In both cases the spell starts at the proper attachment point but doesn't move with the model. It only snaps back to the attachment when the unit moves. Beam: new generic BeamContinuous. Point is the broodlord head but it happens with any attachment point.